Somewhere over the rainbow…Way up high…And the dreams that you dreamed of…Once in a lullaby…Oooh The Wizard of Oz. Who doesn’t love that movie? And if you don’t, then we need to talk. 1. So what do The Wizard of Oz and rainbows and dreams have to do with promoting, anyway? 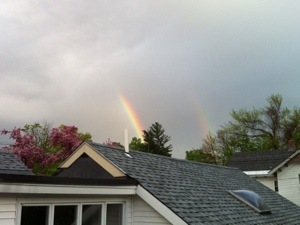 Well, to start, did you like the double rainbow picture? Did it catch your eye? Maybe not or…maybe it did. The point is that pictures are eye-catching. Who doesn’t like to look at them? A lazy rainy day looking through photos is loads of fun. So, if you’re promoting your stuff, include some cool photos. Send me some, and I’ll throw them out to the world for you too! 2. Don’t be shy. “I don’t know why you’re being shy,” lyrics to One Direction’s song “What Makes You Beautiful” is perfect. Don’t turn away from promoting. Be brave. Go. Do it. I know you can. I know because I’m shy. Being shy doesn’t always show. It just means that your stomach feels sick on the inside. Your heart pounds. You may even sweat. And I know from experience that when I’m not in my cozy comfort zone, I start to talk to myself. I say things like “I can’t believe I’m doing this.” If you talk to yourself too, then say positive things in your head like “No matter how this turns out, I’ll learn from it.” Be an optimist. 3. Take the good with the bad. Some days are great. You may get lots of Twitter followers, a good review, positive feedback, a new “like” on Facebook, or someone comes up to you to tell you how you impacted their life (hopefully in a good way). That’s all great. But, then there are those days when everything goes wrong, or seems to. Sales are lagging, and nobody seems to care. Promoting is typically about taking baby steps. Sure you have those incredibly lucky (and talented) people whose work in music, or the arts, or the literary field, takes off with ease; but that’s not most of us. Learn from everything that happens when you promote, and by all means, don’t sweat the negative stuff. Heck, we all go through it. 4. Follow-up. You put your work out there somewhere and you know…They…Just…Don’t…Like it…They Hate it. You feel sure. If you give your work for someone to review, don’t worry about whether or not they like it. Don’t worry if you never hear back from someone, but DO try to follow-up. If you’re in the world of literature, art, or music, you’re going to have to learn to take rejection. That’s okay. It makes all the positive feedback you get the sweeter tasting! 5. Prepare to work your boots off. Make a plan to promote, and stick to it the best you can. I just re-blogged my dear friend MusicmamaB’s latest post “Let Us Never Be Above Work.” Work is good for you. Take care of your health. Work hard. Let your life shine in this world. Make a difference. I know you can! So, what are you waiting for? Go promote! This entry was posted in Uncategorized and tagged arts, inspiration, literature, music, promotion, tips. Bookmark the permalink.